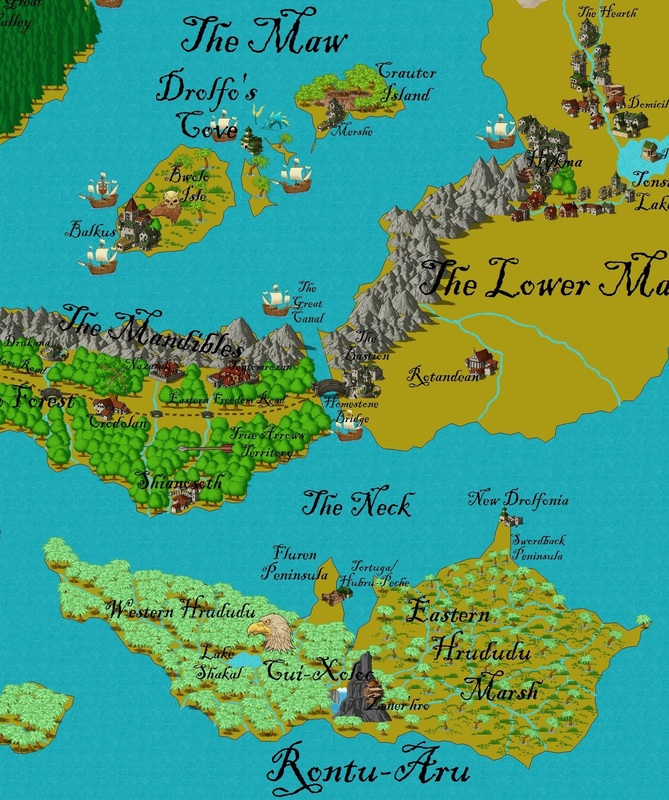 The map I made of Gurutama using Campaign Cartographer. Starting off the posts on Gurutama will contain information my D&D group has already written. After we’ve covered that background information I plan to post more indepth descriptions of places or cultural aspects. Religion, art, holidays, monuments, military, civil administration, all these things were touched on but not explicitly described in our Dawn of Worlds game. I’ll do what I can to get those ideas fleshed out here. So first up, what are these continents we’re looking at on the map? There are four continents on Gurutama, Glacierstone, Hearthland, Rontu-Aru, and the Maw. The Maw is split up into four sub continents, the Upper Maw, the Eastern Maw, the Lower Maw, and the central islands (islands aren’t really a continent, but inner oceans are still defined by tectonic plates). Rontu-Aru, the southern continent, is inhabited mostly by bird people called Avians. Avian culture is loosely based off of Aztec, Mayan, and Inca cultures. Avians build ziggurats like the Aztecs and Mayans did. They live high in the mountains like the Inca did. They sacrifice intelligent beings like the Aztecs and Mayans did. I avoided the term human sacrifice, because in there are more races than humans in our fantasy world. The Avians came into contact with the Merfolk early in our world’s history. The Merfolk are fish people that live around the islands in the central sea of the Maw. 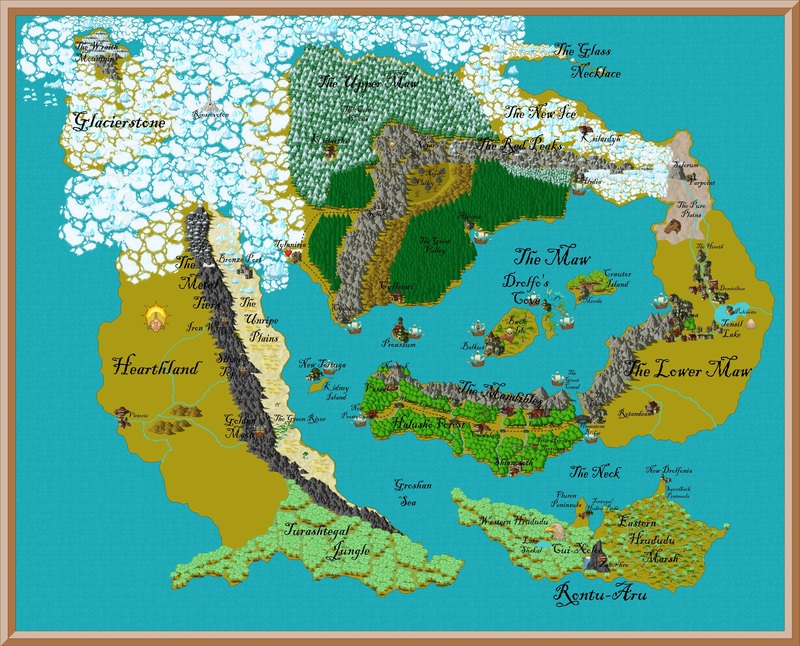 This map shows the Avian continent of Rontu-Aru and the central islands of the Merfolk. The Merfolk wished to make trade easier with the southern sea, The Neck. They prayed to their god, Drolfo, to open up a quick path to the Neck. Drolfo summoned a giant octopus named Selcatnet which dug a trench through the mountain range on the northern edge of the Lower Maw. This trench became the Great Canal that separates the Lower Maw from the Eastern Maw. The Merfolk came down to Rontu-Aru and set up trading outposts with the Avians. The Avians were resistant to the outsiders. Eventually a prophet rose up and formed an army to attack the Merfolk. War raged for many years and eventually the Merfolk won. The fish people enslaved the bird people. Now intelligent beings are exported along with goods from the jungles and marshes of Rontu-Aru. The Merfolk are in an excellent position for trade at the physical center of Gurutama. They trade with all the civilized races of our world, humans, dwarves, elves, gnomes, halflings, and the Rana. Rana are frog people that live in the Eastern Maw. There’s more to get into, but that feels like enough for one blog post. That’s all for now!